Leighton composed a set of Morning Canticles (with words from the Revised Psalter) for the centenary thanksgiving service of Monkton Combe School, held in St Paul’s Cathedral, London, on 8 May 1968. 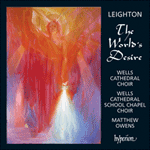 These were settings conceived for the occasion and the choral forces available: they may be performed in unison, for SATB voices, or, as in this recording, for unison voices and SATB chorus. The Venite is set to a vigorous march-like gait, the voices initially in unison, but quickly breaking into two-part imitative counterpoint as God is praised. At ‘today, if ye will hear his voice’ the music reaches its climax. Dissonant organ chords announce the ‘Gloria’, whose melody is a variant of the march tune. The Te Deum laudamus begins mysteriously with the choir singing in unison, as if chanting a prayer. With a quickening of tempo an incessant rhythm on the organ underpins the unceasing praise to God. Apostles, Prophets, Martyrs and Holy Church continue the catalogue of tribute with a melody related to the introduction, to which short decorative arching phrases are added. After a climax at ‘We believe that thou shalt come: to be our Judge’, the tempo slackens as the music briefly takes on a mood of prayerful supplication. From here on, slowly and inexorably, the music swells in power until its emphatic conclusion. With its lightness and spring the Jubilate Deo has the character of a triple-time dance, for this is music brimming with joy. Generally the unison line is supported by two of the choral parts, leaving the others to add decorative contrapuntal lines. A climax is reached at ‘we are his people’; then the music turns reflective with the anticipation of entering the gates of God’s kingdom, before building assertively to ‘For the Lord is gracious’. In the concluding Gloria, sung mezzo piano throughout, the main unison melody is suffused with a halo of decorative embellishments from the upper voices of the choir. let us heartily rejoice in the Rock of our salvation. and sing loudly unto him with psalms. and the heights of the mountains are his also. today, if ye will hear his voice, ye shall know his power.